Amphibian Abstracts: At Present, I Present to You This Present. Which, of course, means right now I'm giving you a gift. What is the gift? Knowledge! Today's comic, while wrapping up the frogs' experiment with streaming music, presents you with some homographs that are heteronyms. Huh? Jokes based on heteronymic homographs really only work in print. Homographs are words with different meanings but the same spellings. You need the context in which they are used to guess at the correct meaning, and I purposely used ambiguous context. But if you were to hear the words spoken there would be no ambiguity - at least in this case. That's because the words used in this comic are also heteronyms (or sometimes called heterophones). That means that they are pronounced differently. Homographs are either heteronyms or homophones, and if they are homophones they are also homonyms. 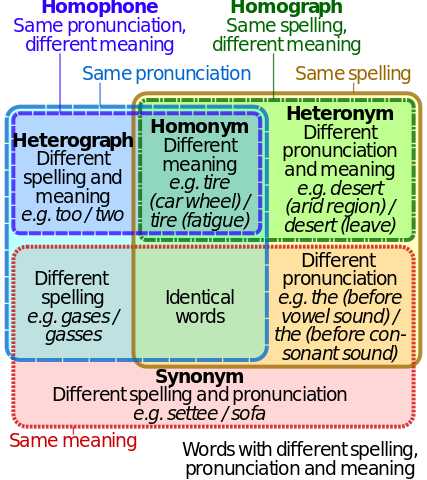 Homophones are pronounced the same but have different meanings - and depending on if they are spelled the same will be either homonyms (same spelling) or heterographs (different spelling). I think the Venn diagram helps. Puns, which I use extensively, usually involve homophones. Phishing and fishing, for example (and they're heterographs). The downside of this comic is that it probably only works in English. Anyone using Google Translate will most likely be disappointed. Or confused. Perhaps both.